Visually inspect hard surfaces for zebra mussels such as docks, dock floats and supports, swimming platforms, boats, motors, anchors, and any objects that have been in the lake or river for the summer. Check areas where zebra mussels may be attached, such as trim tabs, rubber gaskets, grooves along the keel of pontoon boats, and sailboat centerboards. 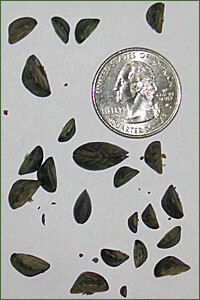 During early infestations, zebra mussels are likely to be small (1/4-1/2 inch long) and the number attached on any object is likely to be low. You can also examine rocks and other hard surfaces along the shoreline and in shallow water, especially near water accesses. Complete and send in a online Volunteer Monitor Report Form by November 1st each year. 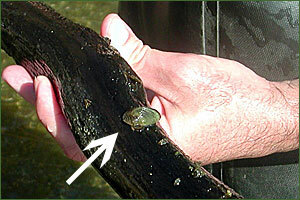 Send in the report whether or not you found zebra mussels. Make your own monitoring device. Hang a PVC pipe , brick or cinder block under a shady spot of your dock (zebra mussels tend to avoid direct sunlight) in the summer to monitor for zebra mussels. Suspend the object as deep as possible at the end of your dock, keeping it at least one foot above the bottom. Examine the monitoring object, and add these observations to the Volunteer Monitor Report Form.